The combination of tacrolimus (TAC), as a potent immunosuppressive agent, with mycophenolate mofetil or azothioprine and corticosteroids is frequently employed in most immunosuppressive post-transplantation protocols. However, maintaining acceptable outcomes is often difficult to achieve without exposure to side-effects. This implies that toxicity associated with TAC can develop at blood concentration levels similar to those required for its beneficial effects. , Moreover, several other clinical factors were found to influence the pharmacodynamics of TAC (demographic,  hematological , , biomedical  , food intake  and time dependence , . Recently, studies speculated that an individual's ethnicity  and genetic composition , could impact tolerance or rejection with no direct correlation to TAC systemic exposure and maintenance of drug trough levels (C 0 ) within the advocated target ranges by routine therapeutic drug monitoring. In addition, TAC is transported out of the intestine, liver and kidney cells via p-glycoprotein (P-gp), an efflux pump encoded by the multidrug resistance-1 (MDR1) gene  , which is also expressed on numerous leukocytes, including T and B lymphocytes. Genetic analyses identified several single nucleotide polymorphisms (SNPs) in the genes encoding for CYP3A4, CYP3A5 , and MDR1. , Over the past few years, pharmacogenetic studies involving kidney, heart and liver transplant recipients have shifted the emphasis away from the association of individual effects of known CYP3A4/5 and MDR1 SNPs on the TAC pharmacokinetics and toward their impact on pharmacodynamic outcomes in these patients. These outcomes included acute rejection, long-term patient and graft survival, infection, nephrotoxicity, diabetogenesis and hypertension. Nevertheless, the complex and inconsistent conclusions of these studies do little to clarify the influence of these SNPs. In regard to CYP3A4, only a limited number of studies have examined the influence of 392A>G on TAC pharmacodynamics and demonstrated no significant impact of this SNP on clinical outcomes. , The few studies concerning CYP3A5 involving adult , or pediatric , renal recipients reported an increased incidence of acute rejection and shorter time to the first rejection episode  in patients who were carriers of CYP3A5 *1/*1 as compared with those with the CYP3A5 *3/*3 genotype. In contrast, two studies in Caucasian adult renal transplant recipients showed no association between patient CYP3A5 genotype and biopsy-proven acute rejection or kidney function tests, , and little data is currently available regarding the impact of CYP3A5 on nephrotoxicity. , In regard to MDR1, it has been hypothesized that acute rejection or nephrotoxicity may be induced by an increase or decrease in drug concentration in T-lymphocytes (the target site of action) and/or renal cells, which could be associated with a decrease or an increase in P-gp function in patients with the variant (homozygous TT) or wild-type (homozygous CC) genotype, respectively. Unfortunately, direct evidence for this hypothesis, based on the TAC intracellular concentration in human T-lymphocytes or renal cells, is yet to be established. Nevertheless, a recent review revealed neither significant nor contradictory findings with respect to the impact of MDR1 on acute rejection and nephrotoxicity. Similarly, the association of CYP3A5 , and MDR1  SNPs with the development of new-onset diabetes and/or hypertension has yet to demonstrate consistency across studies. The aim of the current study was to examine the influence of these SNPs on the time required to achieve pre-defined target blood concentrations and to evaluate the impact of individual and genotype combinations on TAC short- and long-term clinical outcomes including nephrotoxicity, hypertension, infections, acute/chronic rejections, kidney function and graft/patient survival. This study included pediatric renal transplant recipients at the Jordanian Royal Medical Services who received kidney grafts between January 2007 and January 2009 and were followed for at least one year after transplantation. None of the patients received induction therapy. All the patients were treated with TAC and prednisone, in addition to azathioprine or mycophenolate mofetil, throughout the observation period. All immunosuppressive drugs were initiated on the first day after transplantation. Details of the dosage regimen and its adjustments have been described in a previous article. The TAC target concentrations were 10-20 ng/mL during the first month after transplantation and 5-10 ng/mL thereafter. After obtaining an informed consent from each patient and/or their parents, genomic DNA was extracted from whole blood using a phenol-chloroform kit (PIERCE, Rockford, IL, USA). MDR1 exon 26 CC, CT and TT, CYP3A5*1 (expressers) and 3A5*3 (non-expressers) genotypes were determined by polymerase chain reaction (PCR) followed by restriction fragment length polymorphism analysis (RFLP). Data concerning TAC-related clinical outcomes were initially collected from each patient's medical record retrospectively and then prospectively during the entire follow-up period. Acute rejection in this study only included biopsy-proven episodes, defined as a rapid and unexplained rise in serum creatinine of at least 0.3 mg/dL/day above the considered baseline after transplantation, and the use of high-dose steroid therapy or antibody treatment was clearly associated with subsequent improvement of renal function. If signs and symptoms remained unresolved after the "pulse" dose of corticosteroid (methylprednisolone of 500 mg intravenous infusion over 2 h for a three- to five-day period), subsequent therapy was based on the severity of the rejection and anti-thymocyte globulin (ATG) was reserved for treatment of the most severe rejections. Drug-induced nephrotoxicity was confirmed in the presence of high TAC whole blood concentrations with other typically associated clinical manifestations including raised serum creatinine [(SCr) >0.15 mg/dL/day] and blood urea nitrogen (BUN) levels, hyperkalemia, hyperuricemia and decreased fractional excretion of sodium, which all promptly and completely resolved after TAC dose reduction or withdrawal. Chronic rejection was confirmed based on histological findings for renal core biopsy. Graft loss was defined as a condition requiring any other modality of renal replacement therapy. New-onset diabetes mellitus was defined as insulin use for ≥30 consecutive days in previously non-diabetic patients. This was confirmed if the patient continued to have fasting plasma glucose over 126 mg/dL or required blood sugar control with insulin and/or oral hypoglycemic agents for more than three months after transplantation. Newly diagnosed hypertension after transplantation was defined by the mean of two (or more) consecutive blood pressure measurements on separate occasions exceeding 90 mm Hg diastolic or 140 mmHg systolic, or the requirement of an anti-hypertensive medication to control blood pressure for more than two consecutive days. Infections were noted if they were recorded in patients' medical records and if anti-infective therapies were initiated. Where the K factor was 0.55 for all children (boys and girls) aged 2-12 years and girls 13- 21 years, while it was 0.7 for boys aged 13-21 years of age. Categorical data are expressed as counts and percentages, and continuous variables as means with their standard deviations. The incidence of categorical data (nephrotoxicity, acute/chronic rejection, infection, etc.) was examined for statistical significance by Fisher's exact test and Chi-square test. Continuous data were compared using one-way ANOVA and the Wilcoxon test or the t-test. All tests were performed using SPSS (version 16) and a P-value <0.05 was considered statistically significant. A total of 38 pediatric patients were included in the current pharmacodynamic-pharmacogenetic study. The demographics and distribution frequencies of the pediatric renal transplant patients for CYP3A5 and MDR1 C3435T are shown in [Table 1]. The CYP3A5 *1/*1, *1/*3 and *3/*3 genotype was detected in two (5.3%), four (10.5%) and 32 (84.2%) of the 38 children, respectively. The MDR1 C3435T CC, 3435CT and 3435TT were detected in 15 (39.5%), 15 (39.5%) and eight (21.1%) children, respectively. The distribution of baseline patient characteristics [Table 1] did not differ significantly within the subcategories of the two genotypes. Table 1: Demographics and distribution of the pediatric renal transplant patients stratified by CYP3A5 and MDR1 genotypes. [Table 2] displays the impact of CYP3A5 and MDR1 genotypes on patients who achieved TAC target blood concentrations. Notably, none of the patients who expressed C YP3A5 *1*1 or *1*3 achieved the target concentration of 10-20 ng/mL within the first two weeks or even the first month after transplantation. However, 34.4% of CYP3A5 *3*3 achieved and maintained the target goal within the first and second weeks (P <0.05). At three months, no significant difference was observed in the number of the patients within the target concentration range (≥50%) between the three CYP3A5 genotypes. Only two patients exceeded the target range of 20 ng/mL within the first month (*1*3, n = 1; *3*3, n = 1). However, beyond the first month, the percentage of children with TAC concentrations above the defined target (>10 ng/mL) was consistently greater in the *3*3 carriers all the way to the end of the follow-up period. Remarkably, none of the CYP3A5 *1*1 homozygotes surpassed the defined levels (> 20 ng/mL) during first month or >10 ng/mL thereafter. Table 2: Impact of CYP3A5 and MDR1 genotypes on patients achieving target blood concentrations. In contrast, C3435T polymorphism had no significant influence on the percentage of patients achieving either the target or low or high TAC levels. [Table 3] shows the impact of CYP3A5 and MDR1 genetic polymorphisms on clinical outcomes. One-year patient survival rates were 100% in all groups, while the one-year graft survival rates were 96.9% and 93.3% in the *3/*3 and MDR1 CT genotypes, respectively (P = NS). Noticeably, neither of the two patients carrying homozygote wild type (*1/*1) had any adverse outcome, and only one patient carrying *1/*3 had an incidence of acute rejection followed by chronic allograft dysfunction compared with four *3/*3 carriers. Evidently, all other well-established TAC adverse events including nephrotoxicity, serious infections, new-onset diabetes, diabetic ketoacidosis, recently diagnosed hypertension, hyper/hypokalemia and leucopenia were encountered in the *3/*3 group; yet, the incidence rate did not reach a level of statistical significance. Table 3: Impact of CYP3A5 and MDR1 genotypes on clinical outcomes. With regard to the MDR1 genotypic groups, chronic rejection and hypokalemia events were more significantly experienced in the C/T group compared with the C/C and T/T groups (P < 0.05). A positive trend in the incidence of acute rejection and new-onset diabetes in the C/T genotype was also observed, although not to a statistically significant extent (P >0.05). The incidence of other clinical outcomes demonstrated no significant trend in any of the three MDR1 genotypes. [Figure 1] and [Figure 2] demonstrate the mean blood pressure measurements stratified by genotypes of CYP3A5 and MDR1, respectively (ANOVA-test, post hoc multiple comparison P >0.05). Despite the significant decrease in the number of antihypertensive medications indicated in all our pediatric patients after transplantation (2.9 ± 0.23 vs. 2.2 ± 0.86; t-test P <0.000), neither CYP3A5 nor MDR1 polymorphisms influenced blood pressure or antihypertensive drug requirements among the different genotypes before or after transplantation. Figure 1: The mean blood pressure (mmHg) at different time intervals after transplantation in CYP3A5 expressers and non-expressers in pediatric renal transplant recipients. Values represent the means. 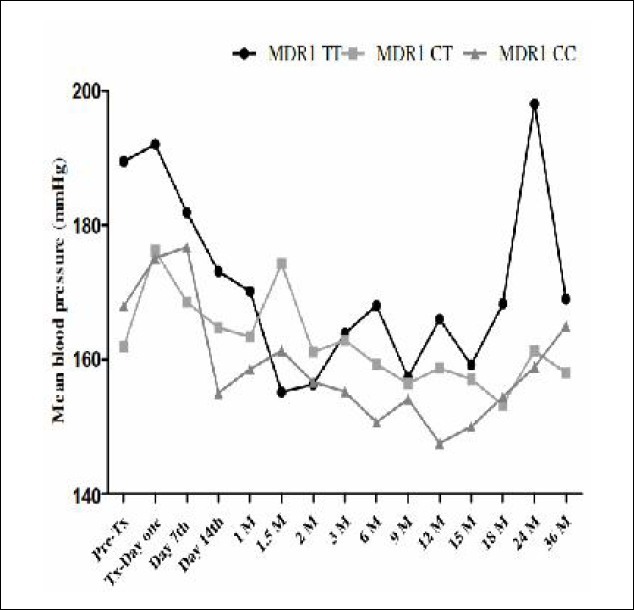 Figure 2: The mean blood pressure (mmHg) at different time intervals after transplantation in different MDR1 genotypes in pediatric renal transplant recipients. Values represent the means. [Table 4] illustrates the impact of CYP3A5 and MDR1 genotypes on kidney function. One year after transplantation, the SCr and BUN tended to be lower in the *1*1 and C/C genotypes compared with their counterparts in the CYP3A5 and MDR1 subgroups, although the difference did reach a level of statistical significance. However, it is important to note that graft function, as measured by creatinine clearance, was significantly higher in the *1*1 expressers than in the *3*3 genotype (P <0.05). Although the creatinine clearance was greater in the C/C group than in the C/T and T/T categories, the difference was not statistically significant. Table 4: Impact of CYP3A5 and MDR1 genotypes on kidney function (follow-up at one year after transplantation). After combining both CYP3A5 and MDR1 C3435T genotypes, only six of nine possible genotype combinations were identified in our study population (A-F; [Table 5]). Similar to the previously observed results of the individual genotype effects, a more significant number of patients in the genotype combinations carrying *3*3 SNP (groups D, E and F) were within the target level in the first week after transplantation than the other groups carrying *1*1 or *1*3 SNP (Groups A, B and C). This observation suggested that the status of CYP3A5 expression or non-expression had a major impact on the time required to reach TAC target concentrations. 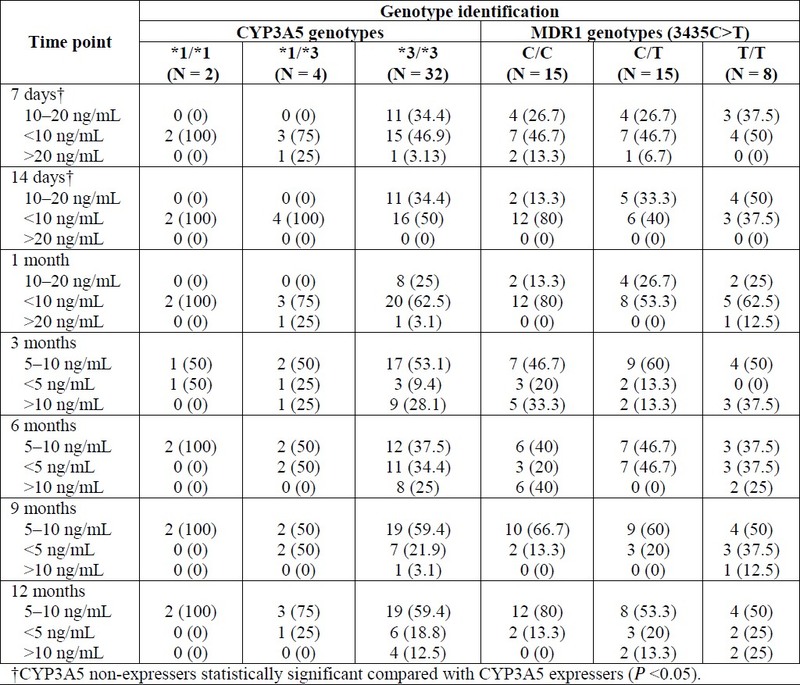 Table 5: Frequency of CYP3A5 and MDR1 genotype combinations in the population of the study. Examining the impact of genotype combinations on clinical outcomes revealed an increased incidence of acute (*1*3/CT, n = 1; *3*3/CT, n = 2; *3*3/TT, n = 1; *3*3/CC, n = 1) and chronic rejection (*3*3/CT, n = 3; *3*3/TT, n = 1; *1*3/CT, n = 1) and graft loss (*3*3/CT, n=1) in patients carrying heterozygous MDR1 C3435T alleles (CT); this suggests a possible additive effect of this SNP on the concurrent combination with a *3*3 SNP. However, further comparison results demonstrated a more independent influence of CYP3A5 non-expression (*3*3), regardless of its MDR1 SNP combination, on the incidence of nephrotoxicity, diabetes, hypertension and infections. Nonetheless, no significant impact was observed for any genotype combinations on renal function parameters (ANOVA-test, post hoc multiple comparison P >0.05; data not shown). Previous TAC pharmacokinetic data in renal transplant recipients have demonstrated that the risk of acute rejection is higher with low systemic exposure to TAC during the early post-transplant period. Therefore, it was suggested that minimum trough levels of 10 ng/mL should be achieved within two to three days after transplantation. A retrospective study by MacPhee et al  subsequently reported adult renal transplant recipients with a greater expression of CYP3A5 (*1*1 and *1*3) to have experienced lower TAC concentrations during the first week with significant delay in the time required to achieve target levels (15-20 ng/mL during Week 1, and then 10-15 ng/L) compared with non-expressers (*3*3), resulting in earlier acute rejection episodes in the former group. This was consistent with the data of Kuypers et al,  in that no difference was found in the overall rejection episodes. 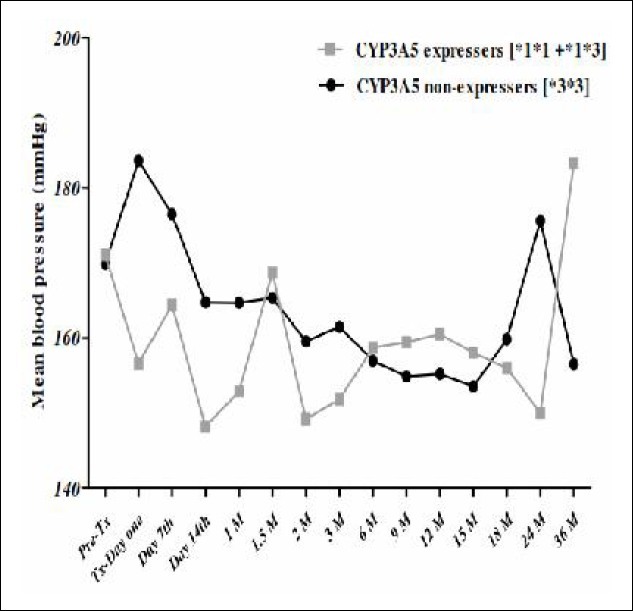 However, an adult  and a pediatric  study in the renal transplant setting demonstrated a significant increase in acute rejection in CYP3A5 expressers. All these studies attributed their findings to the higher levels of CYP3A5 expression, higher metabolic clearance of TAC, low trough concentrations (under-immunosuppression) and, hence, acute rejection in carriers of the wild-type allele (CYP3A5*1). Recently, a large prospective trial demonstrated that a pharmacogenetic dose adaptation based on CYP3A5 genotype was associated with a higher percentage of patients attaining the target concentration in all the genotype categories in a shorter period after transplantation, with less-frequent TAC dose modifications. However, the clinical outcomes, including biopsy-proven rejection, in patients with this optimized approach were similar to those who received TAC according to the standard dose regimen. These findings were attributed to the employment of induction therapy in both groups, resulting in a low immunological risk for acute rejection or other clinical events. Therefore, the authors concluded that the clinical significance of pharmacogenetic adaptation of TAC daily dose should be validated in studies involving higher-risk populations such as those of African origin or those who may receive induction-free immunosuppressive regimens. It is important to note that all previous studies ,,, demonstrating more positive trends for acute rejection in CYP3A5 expressers have also employed induction therapy for most of their patients. However, our results, in accordance with certain studies, ,, included no initiated induction therapy and demonstrated a more positive trend toward acute rejection in CYP3A5 non-expressers, despite a higher percentage of this genotype arriving at desired TAC levels more quickly. Conflicting data were also reported in the literature with regard to nephrotoxicity. Previous renal , and non-renal , transplant studies reported either an insignificant impact of CYP3A5 polymorphisms on nephrotoxicity or a greater incidence in the CYP3A5*1 allele carriers. As with our previous finding regarding acute rejection, all TAC-related nephrotoxicity cases were encountered in the *3/*3 group. This observation was in agreement with the Quteineh et al data. Similar to the Satoh et al  data, the incidence of adverse events including serious infections, new-onset diabetes, diabetic ketoacidosis, recently diagnosed hypertension, hyper/hypokalemia and leucopenia were encountered more frequently in the *3/*3 group. According to expectations and in contrast to the theory explaining the higher incidence of acute rejection in *1 carriers, the higher incidence of all forms of toxicity (including nephrotoxicity) in *1 non-carriers can be explained by the assumption that the latter have lower levels of CYP3A5 expression, a lower metabolic clearance of TAC, higher trough concentrations and intracellular (renal) drug accumulations and, hence, are more predisposed to toxicity. In contrast to our findings and the findings of Quteineh et al,  Kuypers et al  used Cox proportional hazards analysis and reported CYP3A5 *1*3 carriers to be 2.38-times more likely to experience TAC-induced nephrotoxicity than *3*3 expressers due to higher early TAC dosage requirements in the former group. This study also reported no notable difference in TAC blood exposure parameters (C0 or AUC). Interestingly, they attributed this observation to the potential of higher renal tissue concentrations of TAC metabolites due to higher enzymatic activity of gastrointestinal and hepatic CYP3A5. Nevertheless, this hypothesis warrants further confirmation through measurement of both systemic and renal tissue TAC metabolite concentrations. Possible explanations for the discrepancy between our results and theirs may include the difference in the definition of nephrotoxicity (Kuypers et al considered the arteriolar hyalinization instead of our study's reference to functional definitions), smaller sample size, different ethnic population, younger age group, an unrevealed linkage disequilibrium and employment of induction therapy. It has been hypothesized that the predominance of CYP3A5 in the kidney may result in higher blood pressure in individuals carrying the *1 allele compared with non-expressers. This may be due to sodium and water retention. This hypothesis was examined by Givens et al who reported that black patients with a CYP3A5*1*1 genotype demonstrated higher blood pressure than their counterparts with the *1*3 and *3*3 genotypes. Another study involving young kidney transplant patients showed that the mean blood pressure was consistently higher in patients bearing the *1 allele than *3*3 carriers, with a tendency for the number of antihypertensive drugs to be higher in the former group. In contrast, our study revealed no influence of CYP3A5 or MDR1 polymorphisms on blood pressure or antihypertensive drug requirements among different genotypes before or after transplantation. One possible reason for this observation may be the different ethnicity of our patients. Additionally, calcium channel blockers, which are known to have a prominent CYP3A5 inhibitory effect,  were employed in antihypertensive management of more than 80% of our current population. The question of whether MDR1 influenced TAC pharmacodynamics remains controversial. ,,,, In our study, chronic rejection and hypokalemia events were more significantly experienced in the C/T group than the C/C and T/T groups. Moreover, we observed an increasingly positive trend in the incidence of acute rejection and new-onset diabetes, although not significantly so in the C/T genotype. Such findings are consistent with some previously reported results obtained in liver  and lung  transplant studies, although not in renal transplant studies. , Despite the lack of a clear mechanism to explain the current observations, it may be suggested that decreased drug concentrations in the target cells of the patients carrying the wild-type C allele could possibly result in rejection. Yet, it is difficult to explain why these impacts were not observed in the CC homozygous genotype. In conclusion, this study revealed more trends for unwanted outcomes in CYP3A5 non-expressers with an unexplained correlation with MDR1 C3435T polymorphisms. The exact influence on acute/chronic rejection, nephrotoxicity, infections and hypertension require further characterization by functional studies. Furthermore, it is not yet feasible to recommend routine pharmacogenetic testing of individual SNPs for renal transplant patients as the cost-effectiveness requires further prospective clinical trials to examine the variable SNPs combined impacts on short- and long-term clinical outcomes. 1. Staatz CE, Tett SE. Clinical pharmacokinetics and pharmacodynamics of tacrolimus in solid organ transplantation. Clin Pharmacokinet 2004;43:623-53. 2. van Hooff JP, Boots JM, van Duijnhoven EM, Christiaans MH. Dosing and management guidelines for tacrolimus in renal transplant patients. Transplant Proc 1999;31 (Suppl 7A): 54-7S. 3. Wallemacq PE. Therapeutic monitoring of immunosuppressant drugs. Where are we? Clin Chem Lab Med 2004;42:1204-11. 4. Fitzsimmons WE, Bekersky I, Dressler D, Raye K, Hodosh E, Mekki Q. Demographic consideration in tacrolimus pharmacokinetics. Transplant Proc 1998;30:1359-64. 5. Hu RH, Lee PH, Tsai MK. Clinical influencing factors for daily dose, trough level, and relative clearance of tacrolimus in renal transplant recipients. Transplant Proc 2000;32:1689-92. 6. Tomita T, Homma M, Yuzawa K, et al. Effects of Hematocrit Value on Microparticle Enzyme Immunoassay of Tacrolimus Concentration in Therapeutic Drug Monitoring. Ther Drug Monit 2005;27:94-7. 7. Zahir H, McCaughan G, Gleeson M, Nand RA, McLachlan AJ. Changes in tacrolimus distribution in blood and plasma protein binding following liver transplantation. Ther Drug Monit 2004;26:506-15. 8. Christiaans M, van Duijnhoven E, Beysens T, Undre N, Schäfer A, van Hooff J. Effect of breakfast on the oral bioavailability of tacrolimus and changes in pharmacokinetics at different times posttransplant in renal transplant recipients. Transplant Proc 1998;30: 1271-3. 9. Kuypers DR, Claes K, Evenepoel P, et al. Time-related clinical determinants of long-term tacrolimus pharmacokinetics in combination therapy with mycophenolic acid and corticosteroids. A prospective study in one hundred De Novo renal transplant recipients. Clin Pharmacokinet 2004;43:741-62. 10. Park SI, Felipe CR, Pinheiro-Machado PG, Garcia R, Tedesco-Silva H Jr, Medina-Pestana JO. Circadiun and time-dependent variability in tacrolimus pharmacokinetics. Fundam Clin Pharmacol 2007;21:191-7. 11. Felipe CR, Silva Jr HT, Machado PG, Garcia R, da Silva Moreira SR, Pestana JO. The impact of ethnic miscegenation on tacrolimus clinical pharmacokinetics and therapeutic drug monitoring. Clin Transplant 2002;16:262-72. 12. Staatz CE, Goodman LK, Tett SE. Effect of CYP3A and ABCB1 single nucleotide polymorphisms on the pharmacokinetics and pharmacodynamics of calcineurin inhibitors: Part II. Clin Pharmacokinet 2010;49:207-21. 13. Hesselink DA, Bouamar R, van Gelder T. The pharmacogenetics of calcineurin inhibitorsrelated nephrotoxicity. Ther Drug Monit 2010; 32:387-93. 14. Murry GI, McFadyen MCE, Mitchell RT, Cheung YL, Kerr AC, Melvin WT. Cytochrome P450 CYP3A5 in human renal cell cancer. Br J Cancer 1999;79:1836-42. 15. Joy MS, Hogan SI, Thompson BD, Finn WF, Nickeleit V. Cytochrome P450 3A5 expression in the kidneys of patients with calcineurin inhibitor nephrotoxicity. Nephrol Dial Transplant 2007;22:1963-8. 16. Masuda S, Uemoto S, Hashida T, Inomata Y, Tanaka K, Inui K. Effect of intestinal P-glycoprotein on daily tacrolimus trough level in a living-donor small bowel recipient. Clin Pharmacol Ther 2000;68:98-103. 17. Klimecki WT, Futscher BW, Grogan TM, Dalton WS. P-glycoprotein expression and function in circulating blood cells from normal volunteers. Blood 1994;83:2451-8. 18. Hustert E, Haberal M, Burk O, et al. The genetic determinants of the CYP3A5 polymorphism. Pharmacogenetics 2001;11:773-9. 19. Kuehl P, Zhang J, Lin Y, et al. Sequence diversity in CYP3A promoters and characterization of genetic basis of polymorphic CYP3A5 expression. Nat Genet 2001;27:383-91. 20. Hoffmeyer S, Burk O, von Richter O, et al. Functional polymorphism of the human multidrug resistance gene: Multiple sequence variations and correlation of one allele with P-glycoprotein expression and activity in vivo. Proc Natl Acad Sci USA 2000;97:3473-8. 21. Chowbay B, Cumaraswamy S, Cheung YB, Zhou Q, Lee EJ. 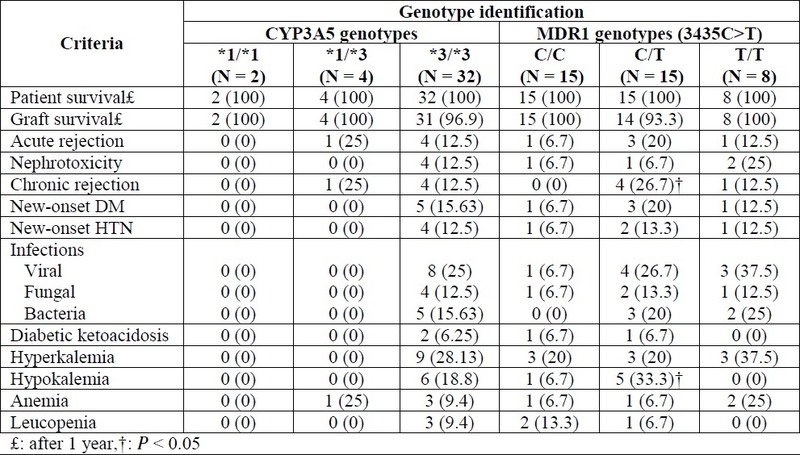 Genetic polymorphisms in MDR1 and CYP3A4 genes in Asians and the influence of MDR1 haplotypes on cyclosporine disposition in heart transplant recipients. Pharmacogenetics 2003;13:89-95. 22. Hesselink DA, van Schaik RH, van Agteren M, et al. CYP3A5 genotype is not associated with a higher risk of acute rejection in tacrolimustreated renal transplant recipients. Pharmacogenet Genomics 2008;18:339-48. 23. Roy JN, Barama A, Poirier C, Vinet B, Roger M. Cyp3A4, Cyp3A5, and MDR-1 genetic influences on tacrolimus pharmacokinetics in renal transplant recipients. Pharmacogenet Genomics 2006;16:659-65. 24. Quteineh L, Verstuyft C, Furlan V, et al. Influence of CYP3A5 genetic polymorphism on tacrolimus daily dose requirements and acute rejection in renal graft recipients. Basic Clin Pharmacol Toxicol 2008;103:546-52. 25. Kuypers DR, Naesens M, de Jonge H, Lerut E, Verbeke K, Vanrenterghem Y. Tacrolimus Dose requirements and CYP3A5 genotype and the development of calcinurin inhibitor-associated nephrotoxicity in renal allograft recipients. Ther Drug Monit 2010;32:394-404. 26. MacPhee IA, Fredericks S, Tai T, et al. The influence of pharmacogenetics on the time to achieve target tacrolimus concentrations after kidney transplantation. Am J Transplant 2004; 4:914-19. 27. Ferraresso M, Tirelli A, Ghio P, Martina V, Torresani E, Edefonti A. Influence of the Cyp3a5 genotype on tacrolimus pharmacokinetics and pharmacodynamics in young kidney transplant recipients. Pediatr Transplant 2007;11:296-300. 28. Naesens M, Lerut E, de Jonge H, Van Damme B, Vanrenterghem Y, Kuypers DR. Donor age and renal P-glycoprotein expression associate with chronic histologic damage in renal allografts. J Am Soc Nephrol 2009;20:2468-80. 29. Ho H, Pinto A, Hall SD, et al. Association between the CYP3A5 genotype and blood pressure. Hypertension 2005;45:294-8. 30. Kuypers DR, de Jonge H, Naesens M, Lerut E, Verbeke K, Vanrenterghem Y. CYP3A5 and CYP3A4 but not MDR1 single-nucleotide polymorphisms determine long-term tacrolimus disposition and drug-related nephrotoxicity in renal recipients. Clin Pharmacol Ther 2007;82: 711-25. 31. Shilbayeh S, Zmeili R, Almardini RI. The Impact of CYP3A5 and MDR1 Polymorphisms on Tacrolimus Dosage Requirements and Trough Concentrations in Jordanian Pediatric Renal Transplant Recipients. Saudi J Kidney Dis Transpl 2013;24:1125-36. 32. Shilbayeh S, Hazza I. Pediatric Renal Transplantation in the Jordanian Population: The clinical outcome measures during long-term follow-up period. Pediatr Neonatol 2012;53: 24-33. 33. Schwartz GJ, Haycock GB, Edelmann CM Jr, Spitzer A. A simple estimate of glomerular filtration rate in children derived from body length and plasma creatinine. Pediatr 1976;58: 259-63. 34. Undre NA, van Hooff J, Christiaans M, et al. Low systemic exposure to tacrolimus correlates with acute rejection. Transplant Proc 1999;31:296-8. 35. Thervet E, Loriot MA, Barbier S, et al. Optimization of initial tacrolimus dose using pharmacogenetic testing. Clin Pharmacol Ther 2010;87:721-6. 36. Kagaya H, Miura M, Satoh S, et al. No pharmacokinetic interactions between mycophenolic acid and tacrolimus in renal transplant recipients. J Clin Pharm Ther 2008;33:193-201. 37. Satoh S, Saito M, Inoue T, et al. CYP3A5 *1 allele associated with tacrolimus trough concentrations but not subclinical acute rejection or chronic allograft nephropathy in Japanese renal transplant recipients. Eur J Clin Pharmacol 2009;65:473-81. 38. Zhao W, Elie V, Roussey G, et al. Population pharmacokinetics and pharmacogenetics of tacrolimus in de novo pediatric kidney transplant recipients. Clin Pharmacol Ther 2009; 86:609-18. 39. Klauke B, Wirth A, Zittermann A, et al. No association between single nucleotide polymorphisms and the development of nephrotoxicity after orthotopic heart transplantation. J Heart Lung Transplant 2008;27:741-5. 40. Fukudo M, Yano I, Yoshimura A, et al. Impact of MDR1 and CYP3A5 on the oral clearance of tacrolimus and tacrolimus-related renal dysfunction in adult living-donor liver transplant patients. Pharmacogenet Genomics 2008;18: 413-23. 41. Haehner BD, Groski JC, Vandenbranden M, et al. Bimodal distribution of renal cytochrome P450 3A activity in humans. Mol Pharmacol 1996;50:52-9. 42. Givens RC, Lin YS, Dowling AL, et al. CYP3A5 genotype predicts renal CYP3A activity and blood pressure in healthy adults. J Appl Physiol 2003;95:1297-300. 43. Kothari J, Nash M, Zaltzman J, Ramesh Prasad GV. Diltiazem use in tacrolimus-treated renal transplant recipients. J Clin Pharm Ther 2004;29:425-30. 44. Bandur S, Petrasek J, Hribova P, Novotna E, Brabcova I, Viklicky O. Haplotypic structure of ABCB1/ MDR1 gene modifies the risk of the acute allograft rejection in renal transplant recipients. Transplantation 2008;86:1206-13. 45. Kreutz R, Zurcher H, Kain S, Martus P, Offermann G, Beige J. The effect of variable CYP3A5 expression on cyclosporine dosing, blood pressure and long-term graft survival in renal transplant patients. Pharmacogenetics 2004;14:665-71. 46. Kreutz R, Bolbrinker J, van der Sman-de Beer F, et al. CYP3A5 genotype is associated with longer patient survival after kidney transplantation and long-term treatment with cyclosporine. Pharmacogenetics J 2008;8:416-22. 47. Hebert MF, Dowling AL, Gierwatowski C, et al. Association between ABCB1 (multidrug resistance transporter) genotype and post-liver transplantation renal dysfunction in patients receiving calcineurin inhibitors. Pharmacogenetics 2003;13:661-74. 48. Zheng HX, Zeevi A, McCurry K, et al. The impact of pharmacogenomic factors on acute persistent rejection in adult lung transplant patients. Transpl Immunol 2005;14:37-42.